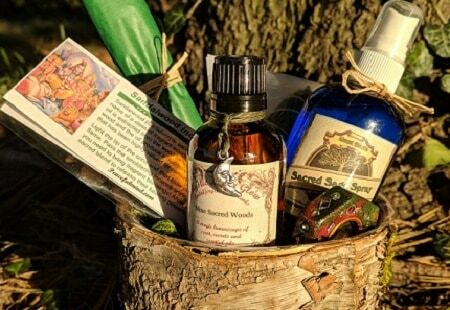 This is a wonderful gift set, honoring the power and amazing scents of earth’s Sacred Trees! 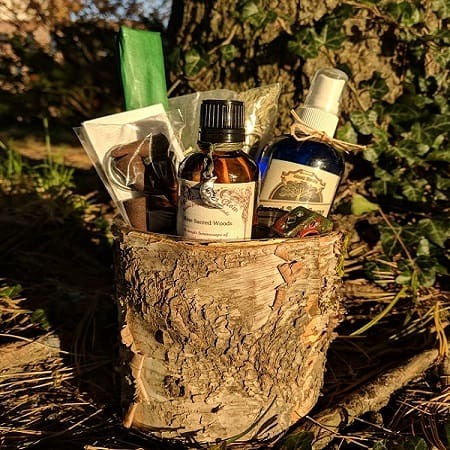 We have combined some of our most popular and beloved products into this very special holiday gift basket! We complete this incredible gift set with our handmade birch basket! This beautiful basket is formed from real birch wood bark and made into a basket that can be used for many a purpose. Plastic liner and natural moss inside. As always, we include complete instructions for each one of your gifts and how to use and care for them, store them and keep them for long term enjoyment! It is also enhances with Sacred Cedarwood, Romantic Rosewood and Precious Pine Needle essential oils. 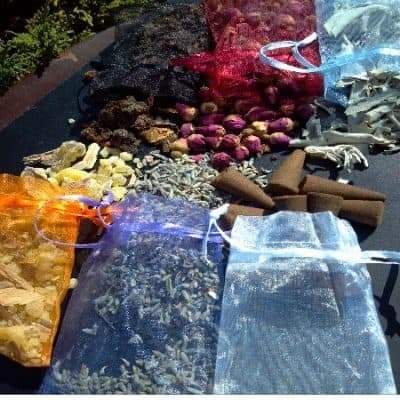 Use as an empowerment oil for bathing, anointing candles, crystals or other metaphysical tools. Blend with other oils to encourage their properties. Bless your body or sacred space by massaging a few drops where needed. Freshen up potpourri or seasonal decor by adding a few drops to a spray bottle full of water and spritzing anywhere to clear the energy and invite prosperity. ~ Comes with an internal dropper within the dark glass bottle. ~ Sandalwood (Santalum) or sacred wood, is the name of a class of fragrant woods from trees which are unlike many other aromatic woods because they retain their fragrance for decades. 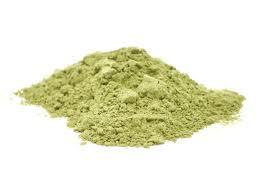 Sandalwood oil is extracted from the wood for use. Both the wood and the oil produce a distinctive fragrance that has been highly valued for centuries. 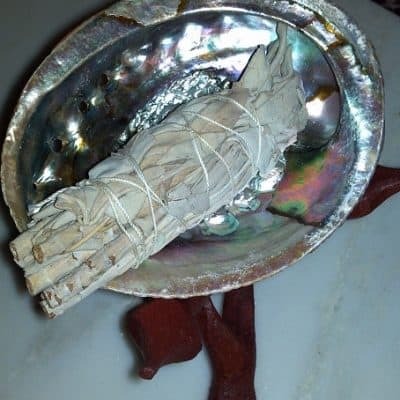 ~ These heavenly cone incense are richly scented, hand rolled cones, which are a great clearing, meditation tool for home, altar, meditation space, sacred place or travel. Sage has a variety of uses. Wonderful for anointing candles, crystals or altar, sage spray is a sacred purifier! Use as a perfume or bath/body mist to cleanse away negative feelings or energies that affect you. Spray over body, meditation space or any room that needs clearing. This sage is from Mt. Shasta. Mt. Shasta sage is very special as it comes from the high energy vortex of this famous and spiritual mountain in Northern California. I have infused Organic sage in spring water from deep underground aquifers, and my own Angel’s Mist Sage Essential Oil. in Scotland, also called The Caledonian Forest, was the site of one of King Arthur’s Twelve Battles. The “army of trees” animated by sorcerers in the Welsh poem (The Battle of the Trees) are intended to be the Caledonian Forest. With a majestic collection of Scots pine, birch, rowan, aspen, juniper and oak, this infamous wood has a hallowed place in Celtic history. ~~We blend together scents of Royal Scots pine with fragrant juniper along with the mystical embrace of lichen, fern and moss. Wrapped in orange paper and tied with raffia. The dragonfly charm of the Celdion Woods represent courage, luck, strength and happiness. ~ Cedar: (Cedrus Atlantica) is considered by some tribes as the “tree of life” because it withstands the four elements year round no matter how harsh the seasons are. It is one of the planet’s oldest trees. Call upon the spirit of the Wolf as a totem animal with these fragrant incense of American Cedarwood.